/ / Content & Copywriting / How Fresh is Your Content? When looking for a new product or service – most of us begin our search online. We’ll start with a visit to Google, Bing or one of the other popular UK search engines. We type in our keywords and voila! – up pops a whole host of individual websites, recommendation and review sites (such as Trip Advisor); plus forums relating to that particular topic. Then, after clicking through a couple of sites, you finally come across what appears to be the perfect company for your needs. They have exactly what you need, at a reasonable price, but whilst reading through the content you find it to be old and outdated. Would you order from them or would you move on? Personally, I wouldn’t order anything from someone who had outdated information on their site. I want to know that the business is active, alive, worthy and that they care about me as a customer. Your website is the digital shop-front to your business. Make it look boring and uninviting and people will walk by. Make it interesting and intriguing and you’ll peak a certain level of curiosity, compelling visitors to find out more. Every update you make to your website, whether on the homepage or internally, plays a massive part in its interaction with your customers, potential Clients and other stakeholders. Static websites that don’t undergo any form of update can be viewed by search engines as ‘dead entities’. Lifeless with nothing new to offer. Thankfully, websites that undergo frequent modification in the form of updated news feeds, blog posts, case studies, testimonials, etc. offer search engines a plethora of fresh content to crawl. And they’ll love you for it! The following excerpt has been taken from a post by SEO specialist Robin Burton. 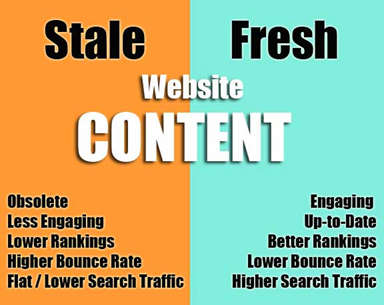 It gives us 5 reasons why fresh content is critical for website and SEO success. Don’t confuse this phrase with the thinking that fresh content will give you higher indexing. That may not be the case. However, the more frequently you update your website, the more frequently a search engine will stop by. Update with articles, downloads, new web pages, news! When search engines view your site more frequently, you can achieve higher rankings based on the content you provide. Search engines use web crawlers, which are simply high-tech programs that scan the internet for websites. 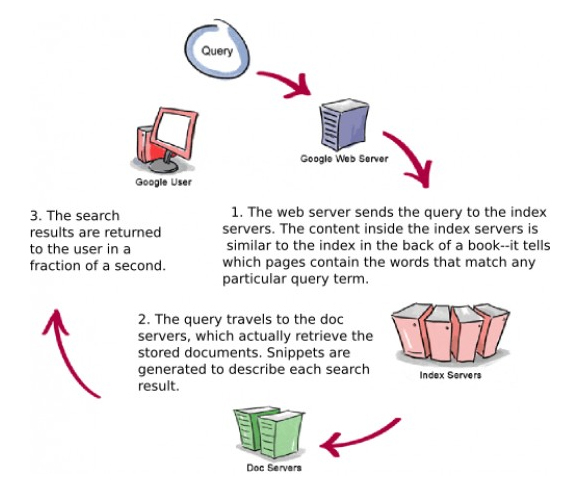 The web crawler “indexes” a site based on a number of algorithmic factors. These are determined by each search engine company. For instance, a site could be indexed based on a combination of the number of incoming links to the site; or the number and type of subject keywords used; or how often a site is updated. Every time you make an update to your website, the search engine will take notice and re-arranges your site’s ranking. So, if you want to increase the chances of your website getting a higher ranking, update the content frequently. Keep in mind, more content is not the key here, quality is. Blast your page with a ton of low-quality articles stuffed with keywords, and you’re going to be penalized. By far, the most frequently used search engine is Google. As the king of all search engines, Google has a tremendous influence on webmasters and how websites are constructed. When Google expresses its love for websites that update frequently, this is a sure sign that you should add fresh content to your website as often as you can. Of course, you should not make unnecessary changes, additions, or postings every hour of every day. A site that is updated once a day, or at least two to three times a week, is considered a frequently updated site. The “Googlebot” that crawls the web constantly searches for web pages that are new or updated and then adds the fresh content to the Google index. If you update your content often with reliable and valuable information, then you have a better chance of Google ranking your site higher with each update. So, add an article, an image or just make some change on your site to get noticed. The easiest and most effective way to stay fresh is to add a blog on your site. If your visitors comment on those articles, that counts as an update on your site. So, write something that will get the attention to begin helping with your frequent updates. When you publish new content, you present yet more opportunities for your site to contain more keywords. Keywords are high on the algorithm chart for search engine indexing and ranking. Frequently added content, such as blog or article postings, allows you to optimize the article with pertinent keywords that can attract visitors to your site. Each time you add a new article, you incorporate valuable keywords. These help a search engine recognise your website as a place searchers can visit for their specific insurance needs. Now, you have to remember that with the algorithm updates, Google does not base a ton of weight on how many keywords your website has. Google is looking at top quality content, rather than keyword-stuffed rubbish content when it indexes a site. Yes, keywords are still a part of your SEO strategy, but you cannot build your entire SEO campaign around a keyword or keyword phrase no longer. Instead, create quality content that yes, has your keywords within it, but only if they are naturally in place. In other words, write content that answers questions, explains how to do something for the reader or provides quality information that they want. Do not write content around a keyword; write it around what the reader wants. Use your Meta tags, title tags and descriptions for your keywords, but leave the content in a more natural state. Informative, valuable content = greater authority potential. Take a look at your competitors’ websites. You might find that the authority sites in your industry have tens of thousands of pages indexed by Google. Google also measures relevance by site saturation. The more valuable content you publish, the better your chances of becoming an authority site. In addition, frequently publishing industry news updates is another solid strategy in becoming an authority site. Each time you update your website with a news story, another page is created and indexed by Google. The more you write on a particular topic, as long as the content is great, you become a stronger authority and people begin to trust what you say. The more they trust you, the more likely they are to purchase from you. Social media platforms are a great place to begin building authority on a topic. Answering questions on forums, posting valuable in-depth articles on your blog or just commenting something worthwhile on other’s blogs can build your reputation. It can also gain you the authority you need in your industry. If you consistently write top quality content, users will become loyal. Loyalty is something you cannot buy, so even the small business owners have a chance to compete with the big dogs of their industry. Another good reason to update your website with valuable content is to keep current subscribers updated, as well as provide necessary information for new visitors to convert to customers. You could utilize an RSS feed that will update subscribers each time you publish fresh content to the website. By keeping your audience engaged, you develop long-term loyalty, which translates into returning traffic that adds tremendous value to your website. Likewise, your continually fresh content can provide new visitors with valuable information about your small business and your products or services. If a visitor was led to your site through a search engine link, then you need to convince them that your product is the best choice for them compared to the thousands (or millions!) of other results presented in their search. Give them articles about customer satisfaction. Inform them on the benefits of your product. Help them understand why they need your product. The more information a potential customer can access, the more likely he or she will be able to make an informed decision to purchase. Regularly updating your website with fresh content will not only garner appreciation and loyalty from your visitors but will put you in good standings with the powerful Google.